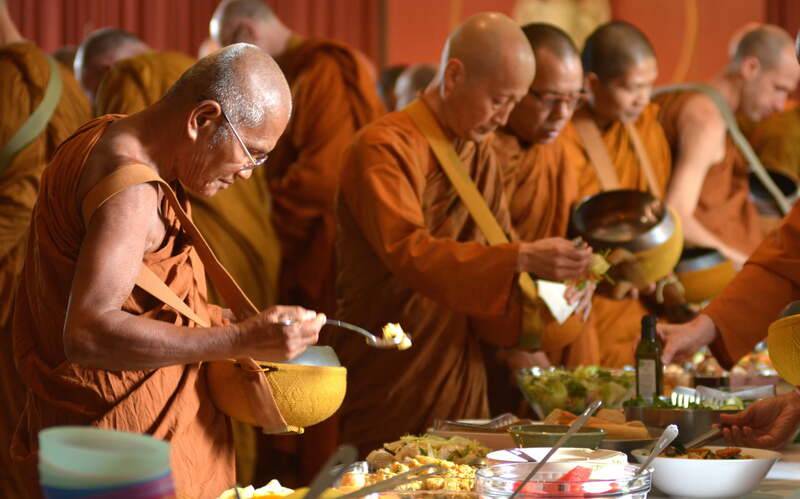 Offering food to the monastic community provides an opportunity to visit and participate in the lifestyle of the monastery. A simple menu is fine, but please remember that this is the community’s only meal for the day. Cooking facilities are available in the monastery kitchen, but some people prefer to cook a dish at home and bring it with them. The kitchen manager can help explain the protocol for offering food to the community. If you are interested in offering a meal, please submit a donation form or contact the monastery. Monastic regulations require the community to finish eating the daily meal by noon. The meal offering and anumodana chanting will start at 10.45 am (November through March) or 11.30am (April through October during British Summer Time). If you have food to offer, please arrive at least thirty minutes earlier, to allow the kitchen staff enough time to arrange your offerings on the servery. If you are planning to bring several dishes, or to come and cook food in the monastery kitchen, it would be appreciated if you could contact us first. You can contact the monastery on this page. During weekends the lay visitors may request the Three Refuges and Five Precepts from the sangha just before the meal offering. On Sunday the sangha gathers fifteen minutes earlier for Paritta chanting. ‘Wisely reflecting, I use alms-food not for fun, not for pleasure, not for fattening, not for beautification, only for the maintenance and nourishment of this body, for keeping it healthy, for helping with the Holy Life; thinking thus, I will allay hunger without overeating, so that I may continue to live blamelessly and at ease.’ The Buddha's reflections on food. Offerings of food and other goods and supplies. The monastic code requires the sangha to depend on the lay community for all physical needs. Besides food, other goods and supplies are needed for the resident community and the running of the monastery. This link to the dana list shows the monastery’s needs at this time.